A Yorkshire bakery customer is such a fan of the family firm’s cheese straws that he gets them delivered 450 miles to his home in the Western Isles. Tony Henk, who lives on the Isle of Lewis, is so partial of Thomas The Bakers “lovely and delicious” baked cheese straws, that regular batches now make the 12-hour trip to his house off the northwest coast of Scotland. 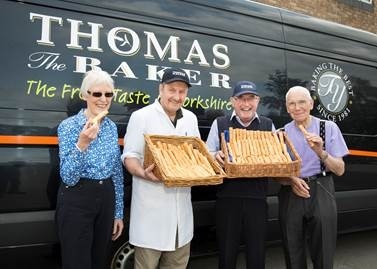 It all began when Tony and his wife, Sylvia, stayed with his sister-in-law in Haxby – home to a Thomas the Baker store – and got a taste for the bakery’s cheese straws, packing their suitcases to the brim on each visit. Then, twice a year, his sister-in-law would send him a parcel of the baked goodies through the post. “She knew we loved those cheese straws and you just can’t get better ones anywhere else; they are so lovely and delicious. Within a few weeks Chris Chapman,quality assurance manager at Thomas the Baker, had been in touch to organise the first batch, and today, the bakery’s biggest fan has become something of a “big cheese”, graduating to become its official cheese straw taster, and testing out their durability during transit for Thomas’s frozen ‘Bake at Home’ range. While the Thomas the Baker team receives regular photo-updates of the straws and corresponds on packaging and baking temperatures, Tony tucks into his favourite food with a good dollop of peanut butter! And earlier this year, Thomas the Baker invited Tony to have a tour of the bakery to see how they were made. “It was great to actually meet the person I had only spoken to by email. “It’s been a big surprise to be asked to get involved in this way.